Three Gorges is the generic terms for Qutang Gorge, Wu Gorge and Xiling Gorge, which are the most beautiful gorges in Yangtze River. Besides the grand and enchanting scenery along the Yangtze River, there are also many historical and cultural sites in the Three Gorges. As the only grand gorge which can be visited by cruise ship, Three Gorges is a golden destination in China. Three Gorges refers to Qutang Gorge, Wu Gorge and Xiling Gorge, which were formed because Yangtze River carving its own path when passing through the eastern edge of Sichuan Basin. Started from Fengjie County, Chongqing in the west and reach to Nanjingguan, Yichang City in the east, with an overall length of 193km, the magnificent Three Gorges was once one of the birthplaces of Chinese culture. The Three Gorges was once the ancient battlefield for the Three Kingdoms, thus there are still many historical sites, which are spread among the three gorges along Yangtze River. From west to east, Qutang Gorge is the first gorge in the three gorges. Start from Baidi Mountain, Fengjie County in the west and end at Daxi Town, Wushan County in the east, Qutang Gorge is 8km long, which is the shortest gorge among the three, yet it's the most precipitous and magnificent one. The mountains in Qutang Gorge stand steep in the gorge, and some of them can reach up to 1,500m high. The river is not wide, and the widest part is about a hundred meters, while the narrowest part is only a few tens of meters, which makes the cliffs at the riverside looking more precipitous. Qutang Gorge is an art gallery of natural scenery and culture, for there are many scenic spots and historic sites. Famous ones are like Fengjie Ancient City, White Emperor City, Kuimen, etc. Kuimen Gate refers to the west entrance part of Qutang Gorge, and it's the iconic landmark in Yangtze River. Chijia Mountain in the south and Baiyan Mountain in the north, the distance between the two precipitous mountains is rather close, and the narrowest part is less than 50 meters, while the cliffs at the river side reach 350m high. The image in the RMB 10 yuan banknote is the scenery of Kuimen Gate, magnificent and splendid. White Emperor City is the best place to observe the magnificence of Kuimen. Original called Ziyang City, which was built by Gongsun Shu in the late East Han Dynasty. Gongsun Shu named himself as White Emperor, thus the city was also called White Emperor City. Due to the precipitous topography, White Emperor City had always been a place of great military importance. Today's White Emperor City refers to White Emperor Temple, where now has several halls built in Ming Dynasty and Qing Dynasty. Besides that, the temple exhibits many poetry inscriptions and cultural relics from Sui Dynasty and Tang Dynasty. As the most beautiful gorge among the three, Wu Gorge starts from Daning River of Wushan Couty and ends at Badong County, with an overall length of 46km. Wu Gorge is also called as Daxia (large gorge), famous for its serene scenery. The whole section is full of strange peaks and grotesque rocks, just like a zigzag art gallery. The most famous scenery in Wu Gorge is the Twelve Peaks of Wushan, and among them, Shennv Peak is the most beautiful one, where tourists can appreciate gorgeous red leaves in autumn. Besides the main river, Wu Gorge has many small streams deserving your visit, like Shennv Stream, Shennong Stream, Lianzi Stream, Shamurang Stream, etc. Shennong Stream is located in Badong County, Hubei Province. With an overall length of 60km, it originates from the south of Shengnongjia (a primitive forest in Hubei) and runs from north to south and finally to Yangtze River through Wu Gorge. The highlight of Shennong Steam is about its primitive and pure natural scenery, local trackers' culture and local ethnic culture. Located in the south bank of Wu Gorge, 20km from Wushan County, Shennv Stream is also called as "Beauty Stream". The whole scenic area is covered with green trees, with crystal clear water and peculiar rocks at the river banks, primitive and ancient, just like a dreamy place. It's a newly opened tourist area, thus, Shennv Stream is quieter than other places in Yangtze River. The Three Gorges Dam is now the largest hydropower project in the world, and it provides tremendous power generation to China and also serves as flood control project. The dam itself is 185m high and 2.3km long, forming a 600km long reservoir. The dam has five parts: Three Gorges Exhibition Hall, Tanziling Park, 185 Park, Jinba Park and Cut-off Memorial Park. . Among them, tourist can overlook the panoramic view of Yangtze River at Tanziling Park, while the viewing platform in 185 Park has the great view of the whole dam. In Three Gorges, tourists can experience the highest gorge bungee jumping in China – Three Gorges Bungee Jumping, which is 61m high, higher than 20 floors. The process of bungee jumping is a challenge to physical and psychological quality. Besides that, there is flying swing, which is 18m from the water and the largest swing can reach to 68m. All these facilities are located in the Happy Valley in Three Gorge Scenic Area in Yichang City. Tujia people in the Three Gorges area are good at singing and dancing, and there are many popular operas. Among them, Badong Hall Opera is the most favored operas. It is composed of gong and drum performance, which are performed to worship the god, and folk dances. Badong Hall Opera has no fixed performance theater, and tourists can watch this performance in many places in Three Gorges area. The best way to travel Three Gorges is taking a cruise ship, and in this way, you don't need to carry the heavy luggage around and keep transferring from one hotel to another. At present, the most popular two routes are: 4 days & 3 nights downstream cruise from Chongqing to Yichang and 5 days & 4 nights upstream cruise from Yichang to Chongqing. In these two routes, when passing through the Three Gorges, tourists can make shore excursions to Shibaozhai Pagoda, Fengdu Ghost City, White Emperor City, Shennv Stream and Three Gorges Dam. The cruise travel will give tourists a full experience of the beautiful scenery in the Three Gorges. There are many cruise ships in Yangtze River, and all of them are equipped with advanced facilities and personalized services. Century Paragon & Century Legend: 2019 Newest Century Cruise ships at the brand-new luxury standard. President No.8 & President No.7: Top largest and Newest Yangtze ships from President Cruises. 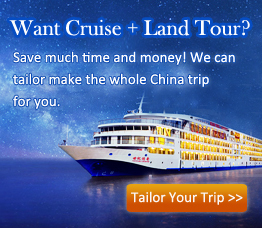 To visit the Three Gorges, tourists need to get to Chongqing or Yichang first, then take the cruise ship from there. Chongqing Jiangbei International Airport and Yichang Three Gorges Airport are the closest airports to Three Gorges. Chongqing Jiangbei International Airport has airlines to over 40 major cities in China, including Beijing, Shanghai, Guangzhou, Xian, Wuhan, Kunming, etc. and it also has international flights to Hong Kong, Singapore, Taipei, Tokyo, Seoul, Bangkok, etc. While Yichang Sanxia Airport has airlines to major cities to Beijing, Shanghai, Guangzhou, Chengdu, Xian, Chongqing, Kunming, etc. and it also has regular airlines to Hong Kong, Taiwan and Busan. Tourists can also take a train to Chongqing and Yichang first, then head to the scenic spot. Chongqing North Railway Station has bullet trains to/from Chengdu, Hankou, Wuhan, Xian, Shanghai, etc. while Chongqing Railway Station has regular trains to/from Guiyang, Neijiang, Zunyi, Kunming, etc. Yichang Railway Station has direct trains to/from Beijing, Guangzhou, Shanghai, Wuxi, Xian, Taiyuan, Wuhan, etc. If you choose a cruise ship, then you don't need to worry about the accommodation. The ship will provide star-hotel level accommodation for its passengers, and tourists can also appreciate the scenery out of the window in the ship. If you choose to visit the Three Gorges one by one from the land, then you can stay overnight at the closest county or city to the scenic area. In Chongqing and Yichang, there are many hotels to choose, from starred hotels to youth hostels. While in the small counties, like Fengjie Couty and Wushan County, tourists can accommodate in youth hostels. Most of the youth hostels are cheap, yet with a good facility and environment. The best time to visit is spring and autumn. During these two seasons, the weather is warm and sunshine is abundant, no matter the green trees and pink blossoms in spring or the red leaves and fresh fruits in autumn, both them are gorgeous. While in summer and winter, the weather is not comfortable as spring and autumn, but the sceneries still have special flavors. In winter, there will be full mountains of fiery red leaves during November and December, which is praised a lot by tourists. The weather in the gorge is humid and fickle, so it's better to bring warm coat and rainproof. If you take a cruise ship, the wind is rather strong when the ship sails, thus, don't stay too long in the deck in case of getting a cold. Average temperature in spring and autumn is between 10℃ and 20℃, sweater, jacket and rainproof wind coat are good choices. Shore excursions of Yangtze River will require tourists to climb mountains, so one pair of comfortable and light hiking shoes are definitely necessary.